Around the year 167 Polycarp, bishop of Smyrna, was martyred in Asia minor. He was born sometime around the year 70 of the first century to Christian parents. Ireneus of Lyons, who was his disciple, tells us that Polycarp was personally acquainted with the apostle John and others who had seen the Lord. Around the year 100, Polycarp was named bishop of the church of Smyrna. He carried out his ministry with total dedication and with a love worthy of the teachings he had received from the apostle John, the 'beloved disciple.' When Ignatius, en route towards martyrdom in Rome, stopped in Smyrna, Polycarp gave him hospitality and encouraged him. In 154, Polycarp travelled to Rome to dicuss the longstanding controversy regarding the date of Easter with Pope Aniceto (?). The two bishops were unable to reach an agreement, but they remained in communion and separated peacefully, after celebrating an agape meal together. Polycarp was martyred in Smyrna at the end of a long life of faithfulness and love for the Lord, and died blessing God for having made him worthy to take part in Christ's cup "for resurrection to eternal life." 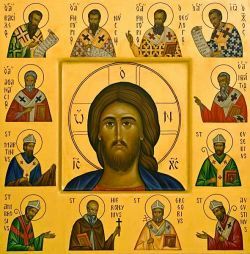 His Passio, one of the most moving early Christian texts, describes martyrdom as the fulfillment of Christian discipleship, and martyrs as "disciples and imitators of the Lord, in their immense love for their king and teacher."